I like serving this with the entrée Whole Chicken with a Sweet Chili Pepper Sauce. However it would make a nice compliment to any grilled meat. The pineapples would be a refreshing delight on a hot summer day. This is a great dish for vegetarians, because no chicken stock is used. Add a sprinkle of flaked coconut to the top for a nice touch. Using a large heavy sauce pan sauté the oil, red pepper and onions over medium high heat. Add rice and stir until a light golden brown. 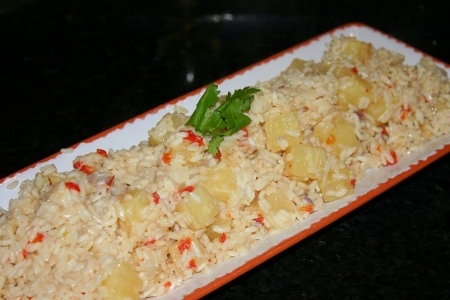 Add can of pineapple chunks, including juice, coconut milk, water and salt. Stir, bring to a boil then cover and reduce heat to low and simmer for about 20 minutes until all the liquid has been absorbed. Stir every five minutes to make sure rice evenly absorb liquid. Top with coconut flakes if desired.